April Sale – 5for1 Deal! Please note: You will automatically receive a FREE 60ml tube White Van Gogh Oil Paint with every purchase of 5 x 60ml Van Gogh Oil Paints. This applies to all increments of 5 x 60ml Van Gogh Oil Paints. Van Gogh oil colour that features excellent tinting strength, a high level of pigmentation for intense colours, a uniform degree of gloss and thickness amongst colours, and good to excellent lightfastness ratings. Painting with Van Gogh oil colours is a joy. Whatever oil colour technique you choose, the pasty paint gives a beautiful result. Choose from a wide and balanced palette. In addition to the lively colours, you above all opt for the certainty of a good oil paint. The fineness, the colour intensity, the high content of pigment and durability contribute to the ultimate expression of your inspiration. 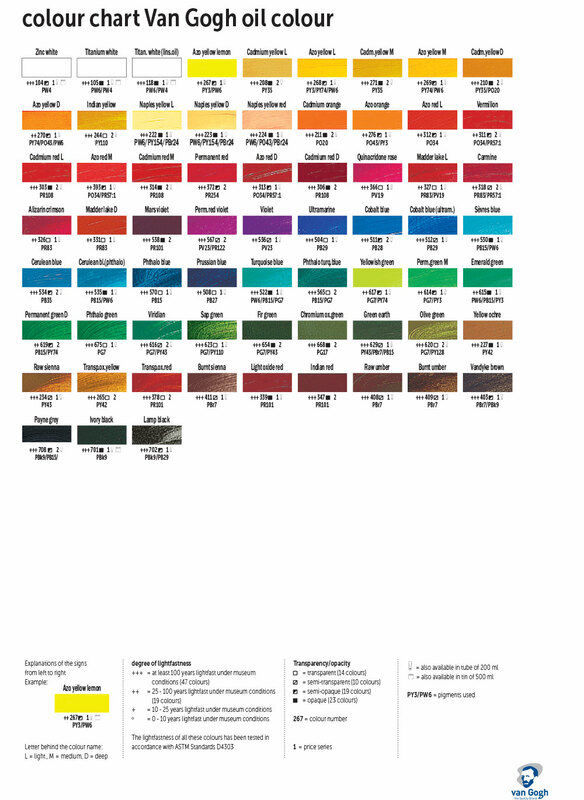 Van Gogh oil colours are available in a wide range of 66 colours in various tube sizes, sets and artists’ boxes.